Regardless of your skin type, your lips are delicate. The lips and the surrounding skin around the lips are vulnerable to drying, cracking, fine lines, and loss of collagen. Lip masks from KNESKO offer a simple solution to help heal previous damage, hydrate, restore volume, and arm your lips with the protection they need to maintain a plump, youthful-looking pout. 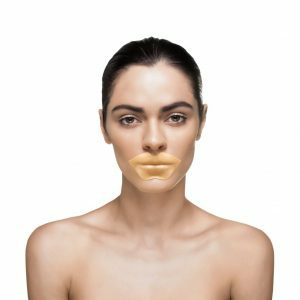 Created by a team of doctors and featuring our exclusive GEMCLINICAL® technology, KNESKO’s collagen lip masks are gemstone-infused and charged with Reiki for benefits that begin within the body’s energy field and end with targeted healing you can see on your lips, including the sensitive skin around your mouth. Get a taste for luxurious, restorative beauty with single treatment lip masks or multi-treatment bundles available in our best-selling lines. 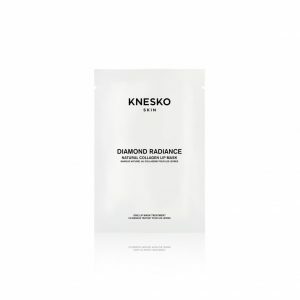 KNESKO’s Diamond Radiance Collagen Lip Masks utilize our ground-breaking GEMCLINICAL ® technology to brighten, nourish and revitalize your lips. Packed with powerful diamond microparticles, these masks gently exfoliate and brighten the entire area surrounding your mouth. Doctor-formulated and lovingly crafted, our masks are bursting with cruelty-free, all-natural ingredients such as marine collagen, rose essential oil, hyaluronic acid and jojoba oil that work in tandem with precious diamond powder to soften your lips and combat signs of aging like discoloration, fine lines, dryness, and loss of volume. Diamonds sparkle with powerful spiritual properties that activate the Crown Chakra and inspire confidence, creativity, and alignment with your higher self. KNESKO’s lip masks harness these revitalizing benefits with Reiki energy so you can relax your mind and rebalance your spirit while you rejuvenate your lips. Much more than simple skincare, our Diamond Radiance masks for lips elevate your body, spirit and mind with a luminous marriage of science and spirituality. 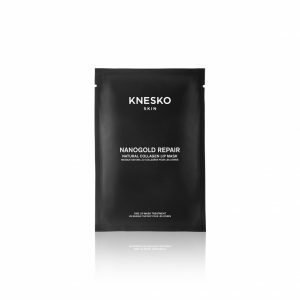 Heal your lips and open your Third Eye Chakra with a Nano Gold Repair Lip Mask from KNESKO. Our GEMCLINICAL® technology combines the firming, hydrating properties of colloidal gold with all-natural, active skincare ingredients such as marine collagen, hyaluronic acid, and aloe extract. Charged with healing Reiki energy, each hydrogel lip mask is a one-way delivery system of gold nanoparticles that quickly penetrate, plump, and restore lips to a more youthful appearance. Gold triggers the Third Eye Chakra and is considered the “Master Healer” for clearing negativity from all the chakras and energy fields within the body. As the powerful gold serum of the lip mask goes to work on your skin, notice how the precious mineral eases away anxiety, strengthens your confidence, allows beauty to flow through you. Heal your lips from the inside out with a Nano Gold Repair Lip Mask. KNESKO embodies a holistic approach to beauty and skin care by embracing both spirituality and science. Our hydrating lip masks showcase this beautiful balance to help you achieve youthful splendor inside and out. Discover what it truly means to speak your truth from plump, hydrated and glowing lips with the help of lip masks from KNESKO.